(Photo: REUTERS / MANDEL NGAN/POOL)An aerial view shows the Zaatari refugee camp, near the Jordanian city of Mafraq July 18, 2013. AZRAQ, Jordan, April 30 (Reuters) - Across the desert horizon of eastern Jordan rows of iron skeleton structures rise from the sand, marking what the United Nations says could become the biggest camp for Syrian refugees in the Middle East. Azraq refugee camp, 100 km (62 miles) east of the capital Amman, was formally opened on Wednesday after 10 months of work paving tarmac roads and constructing thousands of zinc and metal shelters that will ultimately be able to host 130,000 residents. In planning the sprawling 15-square-km site, donors sought to avoid the pitfalls of Jordan's first camp at Zaatari, hastily opened two years ago in a dust-filled border zone where poor services and mismanagement provoked violent protests. "What you are seeing when you drive around is possibly one of the best planned refugee camps in the world and probably what will be one of the biggest refugee camps in the world," UNHCR's Jordanrepresentative, Andrew Harper, told donors and government officials attending the opening ceremony. Unlike Zaatari, the new camp already has two schools and a central hospital run by the Red Cross plus a large supermarket that accepts vouchers from the World Food Programme. "People get to buy what they want to eat so they go home and cook, and so it's an element of normality for them with a supermarket that has full stock," said Jonathan Campbell, emergency coordinator for the WFP. U.N. agencies went ahead with the construction of the mega camp at the height of a refugee influx last year when daily arrivals of more than 1,000 people raised fears that the kingdom would not be able to cope. The opening of the new camp was also an admission of the difficulties of expanding relief efforts insidesouthern Syria to relieve the burden on Jordan, according to diplomats. Four makeshift tent camps have been set up with Saudi aid in recent months inside Syria, close to the border, but fears that they could be attacked by the Syrian army have given impetus to accelerated construction at Azraq. 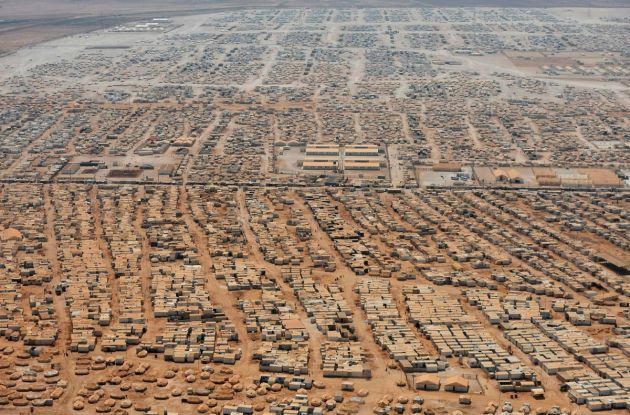 Jordan hosts at least 600,000 registered Syrian refugees, almost a quarter of over 2.5 million in the wider region. Officials say there are at least 1.3 million Syrians in the Jordan, only a fraction of whom live in refugee camps. The opening of the Azraq camp in a desolate area close to the border with Iraq comes after Ammanclosed off unofficial crossings near the Syrian city of Deraa, where refugees only had to walk a few hundred metres (yards) to shelter in Jordan. Now the journey from bloodshed takes several days, through hundreds of kilometres (miles) of Syrian and Jordanian desert to Azraq. This has sharply reduced the refugee flow, according to diplomats and aid agencies. Jordan's political and military establishment has made no secret of its struggle to cope with the refugees and the drain on the resource-poor country. "Today we open yet another camp ... This is not a celebration, the celebration is when we close the camps and when Syrians go back to their homes in peace and security," said Foreign Minister Nasser Joudeh, who attended the ceremony. "I don't want to tell you about the burden on infrastructure water, health and education," he said. The kingdom, he added, would host a U.N.-sponsored meeting next Sunday of Syria's neighbours to discuss the refugee crisis. In the sprawling camp, where only 430 refugees have settled so far, new arrivals gave harrowing accounts of their journeys. "Bandits robbed us of our belongings and remaining cash before letting us move ahead," said Abu Hilal, a father of six children who fled from a village near Palmyra. Adeeb Mohammad spoke of a five-day journey where he paid smugglers 750,000 Syrian pounds ($4,500) to get his family out. "There was fierce bombardment and attacks everywhere. There was no longer a safe place for us so we had to walk all this way."